There I was, idly looking at my timeline for great-granddaddy George's brother John Cockram, when I saw that I had no proof of either of his two marriages. So I set out to find some, which by the way, is a terribly frowned-upon way to conduct one's family research - just popping around here and there, chasing anything that happens to come to one's attention. If I was organized and 'serious', I would have put an entry in a 'to do' list to remind myself to follow this up later, maybe never, and meanwhile stay focused on George. But that's not how I work - genealogy is supposed to be fun, isn't it? So why not chase up whatever interests me, wherever it may lead? And guess where this chase led me - right back to George! At least, I think it did. I found the original record of John Cockram's first marriage, to Grace Adams in 1870, and it got me all excited! Marriage records often have clues about people besides the ones getting married, and in this case, it was one of the witnesses to the marriage that rang my bell. For that witness, ladies and gentlemen, appears to have been The Elusive George himself! I say 'appears' because I'm not 100% convinced it's him, and that's why I need your help to decipher some really awful handwriting. Below is the complete record - the one at the bottom of the image. I've included the other record as well, just so there's more handwriting to draw clues from. Note that Cockram is spelled Cockrem on this document, and for awhile I wasn't sure this was the right marriage, but I've done some checking against other documents, which I won't bore you with, and I'm very sure that this John Cockrem is in fact John Cockram, George's brother. And here's a close up of the most interesting part, the name of the first witness. What is it? I'm pretty sure the surname is Cockrem, but what's the first name? But here's the bad news - you'll see that whoever this witness was, he didn't sign his name, he made his mark instead. Why would George, at nearly 19 years of age, not sign his name? The last sighting of him before this event was in 1861 when he was a 10 year old 'scholar' according to the census. Surely he learned to write! And I've seen his signature and other handwriting on later documents, such as his own marriage record in 1875, so I know he wasn't illiterate. Was he a slow learner, or did he have some nefarious reason for not wanting to sign his name? Once again, George's name throws up a mystery! 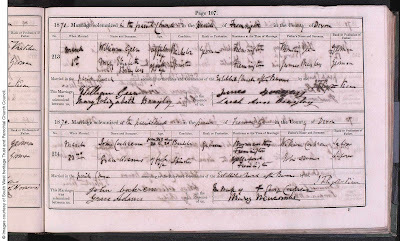 George's signature on his 1875 marriage record, at age 24.
that when he was 18, perhaps he really couldn't write a legible signature. The good news, if this witness is indeed The Elusive George, is that now I know where he was as a young man. This marriage took place in Fremington, Devon where George grew up, so it appears he was still living there in 1870 and hadn't run away with the circus or the Royal Marines. He still eludes me in the 1871 census though. 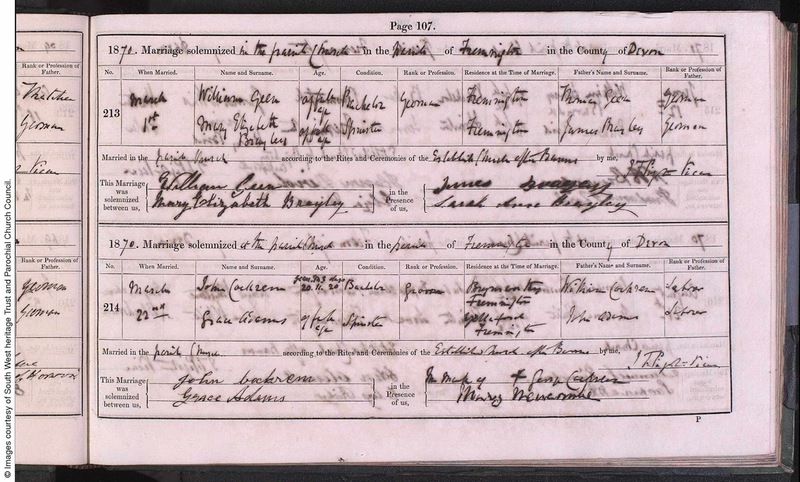 Just one more thing - what do you think John's occupation was, according to this marriage record? In later life, he was a beer bottler, a 'licenced victualler' and the manager of at least one public house. When he got married he was just under 21 years old and virtually everyone in his family was a farm labourer or domestic servant. But this word looks sort of like 'grocer' to me. UPDATE: On the other hand, maybe it's supposed to say 'gardener'. I've just found John and Grace living in Wales in 1871, where John was working as a 'gardener/domestic servant'. Any and all insights into deciphering this handwriting or thoughts on why the witness couldn't or wouldn't sign his name, will be most appreciated.